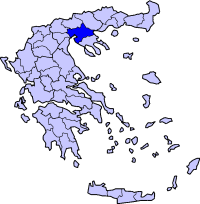 Chortiatis (Greek: Χορτιάτης) is a suburb and a former municipality in the Thessaloniki regional unit, Greece. Since the 2011 Kallikratis local government reform it is part of the municipality Pylaia-Chortiatis, of which it is a municipal unit. It lies at 600 metres altitude on the slopes of the Mount Chortiatis, from which it takes its name. In the antiquity, mountain and town were known as Cissus and Homer tells us that Cisseus was the king of this town. 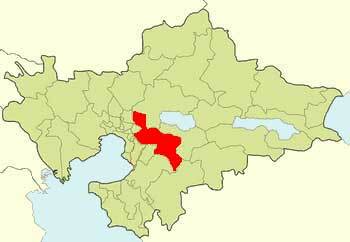 The town and its people are mentioned as members of the Delian League in the 5th century BC. The modern name and town Chortiatis can be traced back to the 12th century, when a Byzantine monastery under the name Chortaites, on the northern slopes of the mountain, provided Thessaloniki with fresh water by an aqueduct whose remains have been partly preserved. By the 15th century the settlement with the monastery was called Kastron Chortiatis (Castle Chortiatis) and it fell in 1423 under Ottoman rule. 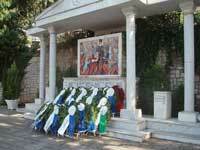 The Chortiatis massacre was a World War II mass murder of 146 civilians by the Wehrmacht, at the end of the occupation of Greece by the Axis powers on 2 September 1944. After the capture of three German soldiers by the Greek People's Liberation Army (ELAS) on mount Chortiatis, the German occupation authorities decided to react immediately with a reprisal operation against the civilian population of the village Chortiatis. About twenty trucks with German soldiers and the paramilitary force Jagdkommando Schubert, named after the Wehrmacht sergeant Friedrich Schubert who was in command, surrounded the village. They gathered all the people they found in the town square, and began to loot and burn houses down. One group of the civilians was led into the house of villager Evangelos Ntinoudis. They were locked inside and the building was set on fire. They were burnt alive. The other group was locked in the bakery. Schubert's men set up a machine gun and began to shoot them down from a small window in the door. After this they set fire to burn alive those who were not killed by the bursts of the machine gun. Apart from the people who were killed in the two groups, others were raped and killed outside their homes or even the village, while trying to escape. A total of 146 civilians residents of Chortiatis were killed that day. 109 of them were women and girls. 300 homes were burned down.